In January 2005, Cheap Monday was developed into a brand with full scale collections and the distribution was extended to selected stores in Sweden as well as abroad. From the first delivery of 800 pairs of jeans in March 2004, the production has reached a new level in terms of pieces as well as in product range. Today Cheap Monday carry main collections for men and women as well as three in-season drops/season. The collections also include baby, accessories, glasses, underwear and shoes. 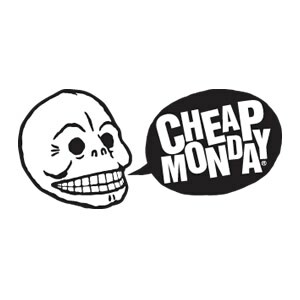 In 2008 the brand joined forces with H&M and in November 2009 the very first Cheap Monday Store opened up in Copenhagen. Without traditional marketing but with a strong idea on how to present the brand, Cheap Monday can today be found in more than 35 countries in about 1800 stores all over the world. Despite the fast growth our original idea still remains: to offer our customers pieces that compete with high-end brands both in attitude and fashion-level as well as in quality – always at an extremely good price.